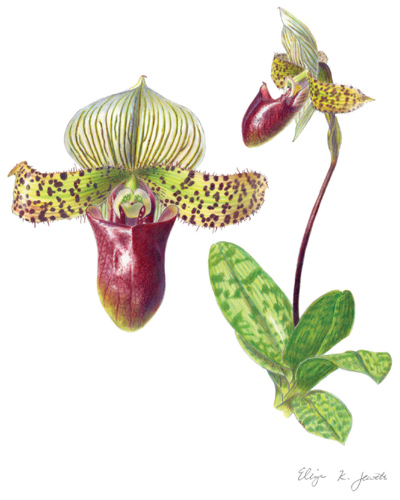 past decade, including those sponsored by the American Society of Botanical Artists (ASBA) and The Horticultural Society of New York, Filoli, the Guild of Natural Science Illustrators, and NCalSBA. Her illustrations have also been published in books, magazines, educational materials, and scientific papers. 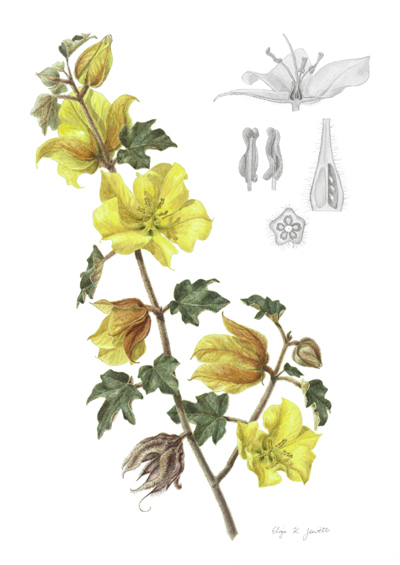 Eliza currently works as a staff illustrator (using entirely digital media) at Annual Reviews, a noted scientific publisher, while doing botanical art, freelance illustration, and graphic design in her spare time. She is most inspired to paint those plants that are more than merely beautiful subjects, but also have local importance or meaningful stories, such as California natives, threatened species, and culturally or medicinally important plants. She sells originals, giclee prints, and cards, and frequently works on commission. Eliza received her B.A. from Harvard University, where she majored in biology with a focus on botany and conservation biology, and graduated from the UC Santa Cruz Science Illustration certificate program in 2004.